The day started with a call to Burlington Chine and a report of a deer fallen from the cliff. Members of the public reported the deer fell onto the beach before swimming out to sea. The deer swam north and then turned south before becoming motionless and disappearing. The team searched the beach and sent a unit to NCI at Peveril to search the bay but nothing further was located. Later in the day, the patrol were tasked to a report of a vessel aground near to the Training Bank at Studland. On arrival a large motor cruiser was high and dry so the team ensured the owners were safe. Finally with the tide turned Poole RNLI ILB and Lifeboat arrived to assist the craft off the beach. Whilst monitoring this incident the team also attended a yacht in the entrance to Poole Harbour having difficulties and assisted a broken down jet ski at Shell Bay. A busy start to the Easter weekend when the team were called to Durlston to support colleagues from Dorset Fire and Rescue. A number of calls had been received reporting a deer at the bottom of the cliff. Swanage RNLI ILB was launched also to investigate and soon found the small deer in a cave. Deer are quite common in this area and the advice from the Country Park Wardens is to leave the deer as they will get themselves out either by jumping back up the ledges or actually swim! The crew of the lifeboat decided that they would recover the deer and released it ashore in Durlston Bay. Shortly afterwards the team were tasked to Winspit to support colleagues from St Albans with a female who had fallen suffering a head injury. Rescue 189 from St Athan was tasked and airlifted the lady to Southampton. Rescue 189 - normally seen in Wales and North Devon ! Finally as we were dealing with the airlift , the team were called to a report of clothing left on Swanage beach. The clothing and personal items (including an inflatable unicorn) had been left for sometime and there were fears someone was in the water. As the team arrived someone made themselves known and it was quickly established all was well. Please if you see someone in trouble or some thing not right - 999 Coastguard rather than facebook. Its the Easter Holidays , the sun is out so that will bring people to the outdoors. Enjoy the holidays but some simple advice will ensure your visits will be even better. Ensure you have the right clothing and foot wear for the activity you are doing. Check the tides - don't get cut off. Its not health and safety gone mad, just some simple tips to try and avoid an accident spoiling your day. In a Coastal Emergency - dial 999 ask for " COASTGUARD"
Due to the Parish Slipway having an extremely slippery surface at the present time the slipway has been closed. Relevant warning signage is in place. Discussions are being held with the Environment Agency regarding advice on next steps. Thank you for your patience whilst this matter is being resolved. The team were called on Thursday to Knoll Beach Studland to assist Dorset Police with a high risk missing person. Spending nearly three hours searching from Middle Beach to Old Harry, a decision was made to stand the team down as all the key areas had been searched. Police later found the person safely in Swanage. Having just returned to the station the team were again tasked to the Parish Slipway after a report of some pollution. Large areas of the usual green seaweed had turned white and become very slippery. The team met Town Council officials and having sent some photos to the Environment Agency advised that some warning signs be put up. The Town Council have now closed the slipway and are working with the Environment Agency to remove the sea weed. Finally it was out for rope training in the evening on the Downs at Swanage. The team were tasked this afternoon to the north end of the bay and a person who may have got stuck on the cliff. The person had been paragliding but landed in a wooded area later returning to the site to recover their equipment. A concerned member of the public worried for their safety called 999 and the Coastguard were sent to investigate. Having searched the cliff , the person was located having retrieved their equipment and making their way safely back to the beach. Our training continues and this week we headed up to Anvil Point for a night exercise. During the day , the area looks very different. This is a popular climbing area and not always straight forward for us to set up. Working at night adds in the need for lighting and the correct clothing. Working a distance from the cliff edge and ensuring the lines don't get snagged on the sharp rocks. We continue to train and test out different types of rescue, just in case we are needed. In a coastal emergency , dial 999 and ask for the Coastguard. The person in charge of a rescue on the ground is called the Officer in Charge and given the call sign of "Oscar". Their role is to implement the rescue requesting Search and Rescue Assets like a Coastguard Rescue Team , Lifeboats or a helicopter. They will also act as the senior coastguard on scene when working with partner agencies. It can get very busy sometimes, with the flow of information at the scene going back to the Operations Centre with multiple radio messages, phone calls and direction to those on the ground to be given all at the same time. A tabard is worn to identify the role and ensure that partner agencies can clearly identify who is in charge, this is in line with something called JESIP or Joint Emergency Service Interoperability Principles. Sometimes, Coastguarding isn't as straightforward as it could be, and some things just don't add up. Take the incident from Sunday when three men were rescued from a yacht in Studland, having capsized out of their overloaded dinghy. It's 4.35pm and the pager goes off. A member of public has seen a white dinghy in Studland Bay overloaded with three men on it. When he next looks, he can still see the dinghy but the three men have come out of it and are in the water, struggling. He calls the Coastguard on 999. The men manage to swim to a nearby yacht and climb aboard. There is nobody else on it, but it's lucky the yacht is there as without it there is a real risk to life. It is raining, with high winds and the men are not equipped to be in the water. Swanage Coastguard and Swanage Lifeboat attend. The lifeboat spots the empty dinghy matching the first informant's description and then spots the three men waving from the yacht. It collects them and on seeing their condition takes them immediately to waiting ambulances and to the Coastguard team on the shore. The men are drunk and explain that they were camping on the beach for the weekend and had decided to go fishing. They explain how they had bought an inflatable dinghy to go fishing and how it had capsized when they were on it. The dinghy that the member of public saw isn't inflatable and neither is the dinghy that the lifeboat spotted. The Coastguard team collects the men's belongings from the beach for safe storage and there is no sign of an inflatable - no pump, no bag etc. Fast forward to Monday and the three men from Sunday return to collect their belongings. The mystery of the inflatable vs fibre glass dinghy is explained to them, and the risk that further search and rescue assets could be deployed if a dinghy other than their inflatable is located. They confirm they were in a white inflatable dinghy with a black line around it. We have to take their word. Monday evening and the rig support vessel in Poole bay picks up a white fibre glass dinghy with a blue inside. 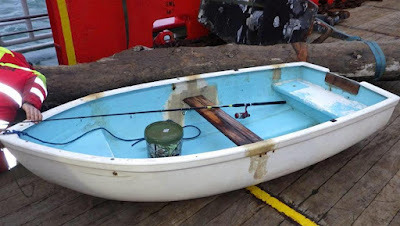 It fits the description of the boat that the member of public had seen in trouble the day before and it has a fishing rod and a bait bucket in it. Surely this must be connected to the incident on Sunday? We ring them and again they say no. We then start several hours of enquiries as there is now concern that in fact someone else is missing, we decide to trace the owner of the boat through Social Media and at the same time deploy a team to investigate. 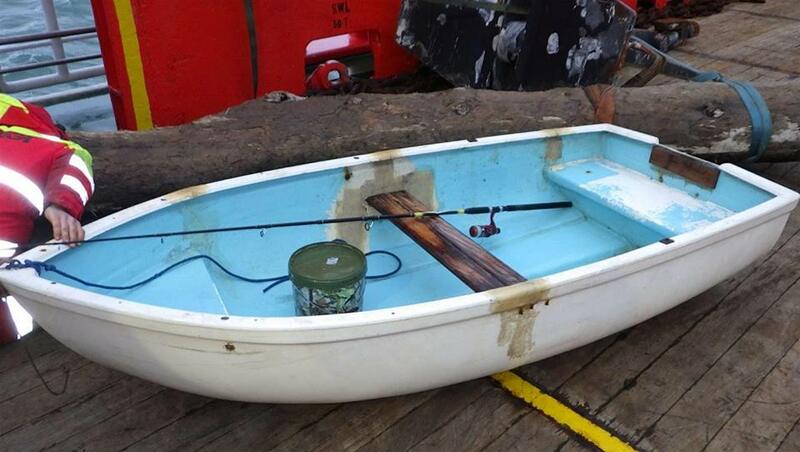 Very soon the owner is identified in Studland - he is indoors and not using the boat today. His description is spot on, but he hasn't left any fishing gear in it. Additionally the boat had been left near to his beach hut protected by a secure fence. Should we commence a further search using several Coastguard teams a helicopter and Lifeboats? We review the facts with our colleagues in the National Maritime Operations Centre and with no other person being reported missing the team is stood down after a combined total of 20 extras hours of enquiries. The inflatable still hasn't been found and the Police are now investigating damage to the fence , the mystery of how the dinghy got moved to the water and had fishing equipment in it remains. Dorset Police requested Coastguard assistance at around 1.00am this morning, Monday 25 February 2019, to reports of a concern for the welfare of an elderly woman who had left her home address in Swanage. Whilst police officers carried out a search of the immediate area, the Coastguard team undertook a detailed search of the shoreline from the Pier to Sheps Hollow. Both Swanage lifeboats launched and concentrated their searches in the bay. Just as the Coastguard team (by now reinforced with colleagues from St Albans) was about to redeploy to the area on the other side of the Pier, very sadly the body of the woman aged in her 80s was located off Peveril Point at around 2.45am. Our thoughts are with the lady's family at this time.